Throughout the spring and summer, we cautioned against the media bandwagon that President Assad is winning the 42-month Syria conflict. We noted that, while the regime had achieved notable successes such as the clearing of insurgents from Homs and “reconciliation” agreements near Damascus, it was still under pressure and facing defeat elsewhere in the “patchwork war”. Our words had little effect, but this week the tune in some of the media has suddenly changed. Now Assad is no longer winning but at risk of losing…. Three years into the revolt against his rule, Syrian President Bashar al-Assad is in a stronger position than ever before to quell the rebellion against his rule by Syrians who rose up to challenge his hold on power, first with peaceful protests and later with arms. Syrian President Bashar al-Assad’s hold on power is looking less certain than his recent assertions of victory suggest, as America snubs his appeals for a partnership, Islamic State militants inflict defeats on his troops and his own Alawite constituency shows signs of growing discontent. Syrian President Bashar al-Assad, who four months ago seemed on the verge of defeating rebel forces, is now mired in defensive battles on several fronts, complicating efforts to fight the Islamic State militant group. 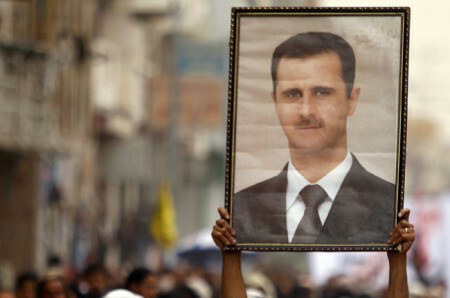 Better armed, organized, supported and motivated, Assad isn’t going. Most likely, he will get the country back, inch by bloody inch. We must also avoid giving the impression that military action in Syria is intended to support the regime of Bashar Assad….With a lessened threat from the Islamic State, those around Assad may be persuaded that it is time for him to go. We await statements from USA Today (“Assad May Have Won the Civil War” — May 2014), analyst Joshua Landis (“Today, Assad is winning the war in Syria quite handily” — April 2014), and financial news outlet The Fiscal Times (“With Latest Victory, Assad Has Won the War in Syria” — March 2014).